For the first 20+ years of our married life we celebrated my husband’s Halloween birthday either by taking our sons out trick-or-treating or answering the door to hand out candy to the trick-or-treaters in our neighborhood (or both). For the last decade or so, we’ve carefully avoided trick-or-treaters by planning dinner out and have learned to linger over our food and enjoy the mostly empty restaurants on Halloween evening. This year, it seems we have been celebrating all month. We headed off to Disneyland earlier in October (see here), spent last weekend in Alabama with his family, and yesterday set off for an adventure on Catalina Island (about 26 miles offshore from southern CA). To make this treat less of a trick, this year Halloween fell on a Saturday. 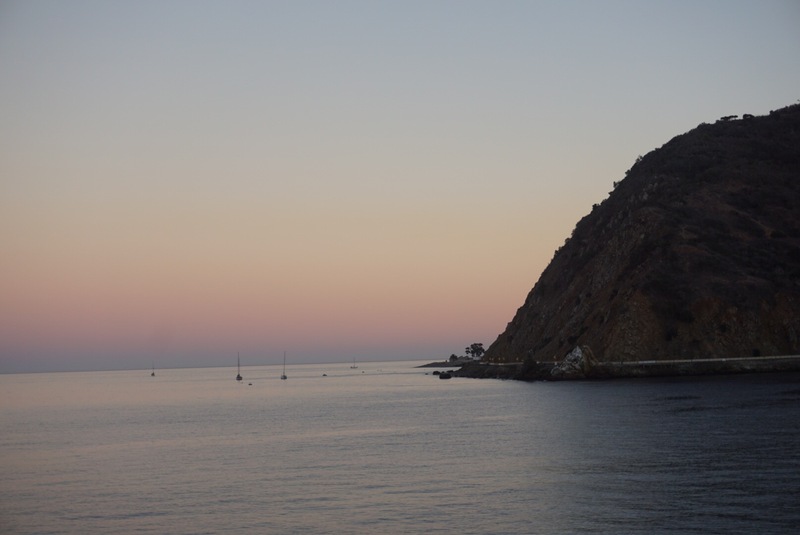 We’d talked about exploring Catalina for a while now…and when we learned that the boat ride over is free on your birthday, it seemed like the perfect solution to our Halloween/birthday celebration dilemma–we turned the trick into a treat! We headed out from Long Beach and were accompanied by playful dolphins as we neared Avalon. They jumped and dove, surfing the wake of the boat. I wasn’t able to take any decent photos, but the view was majestic…and unforgettable! 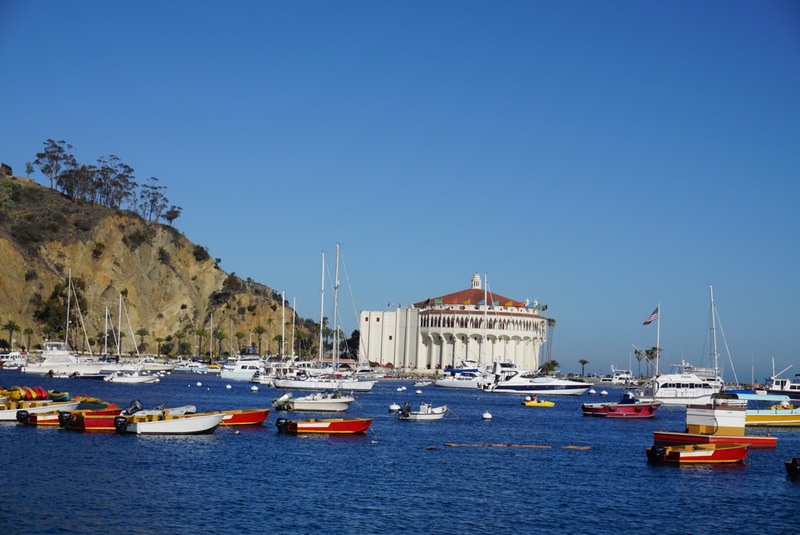 We arrived in the Avalon harbor to a beautiful, warm and sunny day making the blues brilliant and the whites crisp as you can see in this unedited photo. After breakfast we climbed into a military hummer for a tour of the interior of the island. We maneuvered over rocky, dusty, steep unpaved roads as we explored the history and the topography of the island. We learned about the native plants and animals, the conservation efforts, and how they are dealing with the drought. And the views were breathtaking! 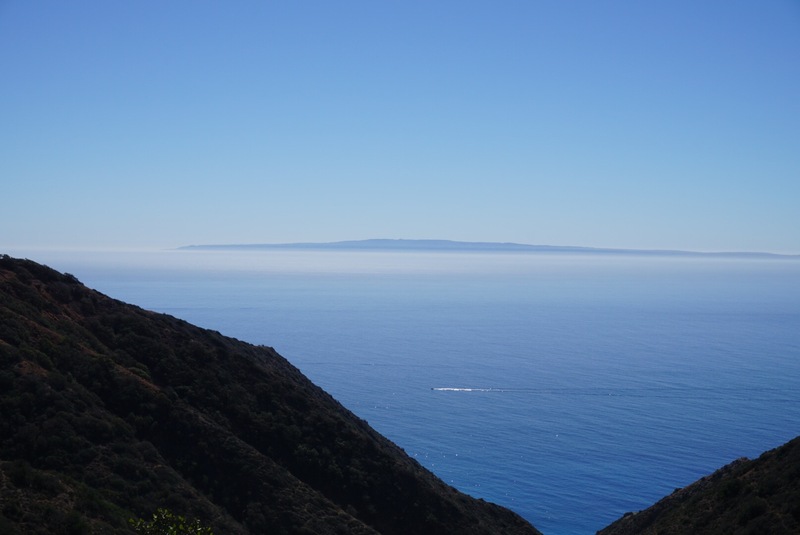 You can see San Clemente Island in the distance, almost seeming to float on the sea. The sky was so clear we could see for miles! 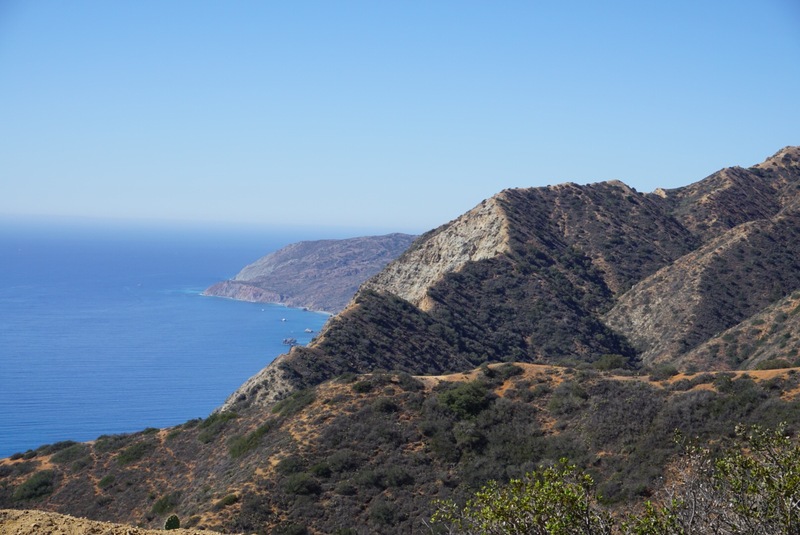 We also took in the prickly pear as well as other native plants, and learned about the Catalina fox and the bald eagle–both which faced near extinction on the island and are now recovering. We also learned about the only non-native animal on the island, the buffalo, brought originally by a Hollywood movie maker at the turn of the century and then encouraged by the Wrigley’s who owned the island. In its native beauty, the island is spectacular, now mostly owned by a conservancy that protects and maintains its natural state. Hot and sweaty from our time in the back country (it was an 85 degree day! ), we treated ourselves to some ice cream and spent some time exploring the city of Avalon. 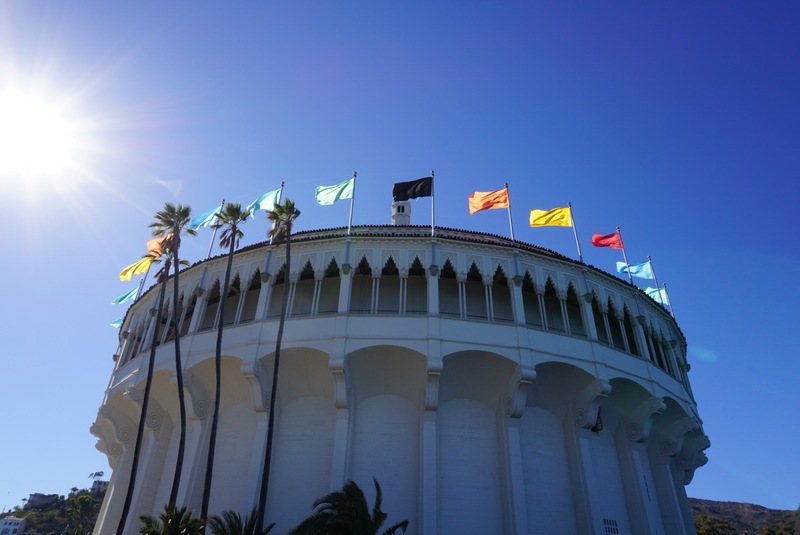 The iconic building is the casino, but it isn’t a gambling hall, it is the home of a movie theater, a small museum, and we hear…a magnificent dance floor. We hoped to go inside, but alas, it closed quite early on a Saturday. We did explore the outside. 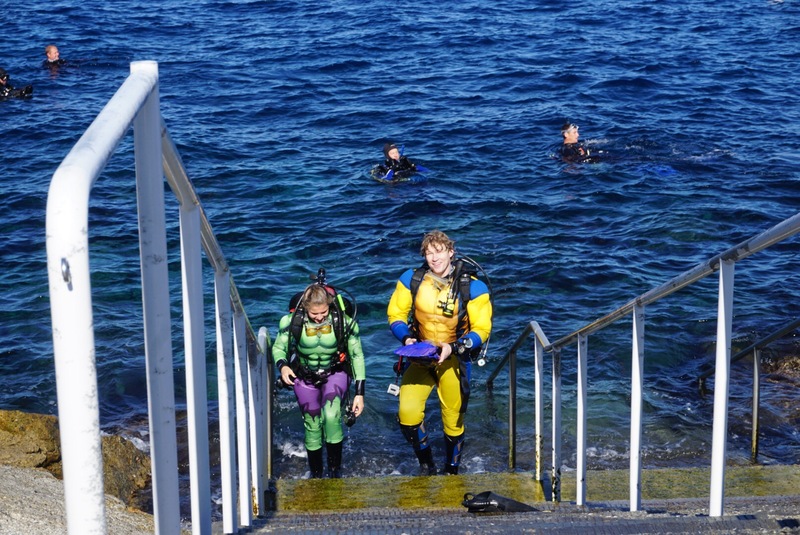 We spent some time watching the divers who enter and exit the water from behind the building. While I was watching them, I noticed a couple in what seemed to be brilliantly colored wetsuits (most wetsuits are black). As they swam up, I noticed that the Hulk and Aquaman (I think) were emerging from the sea…and was ready to snap a few shots as they headed for dry land. They were definitely diving in the Halloween spirit! 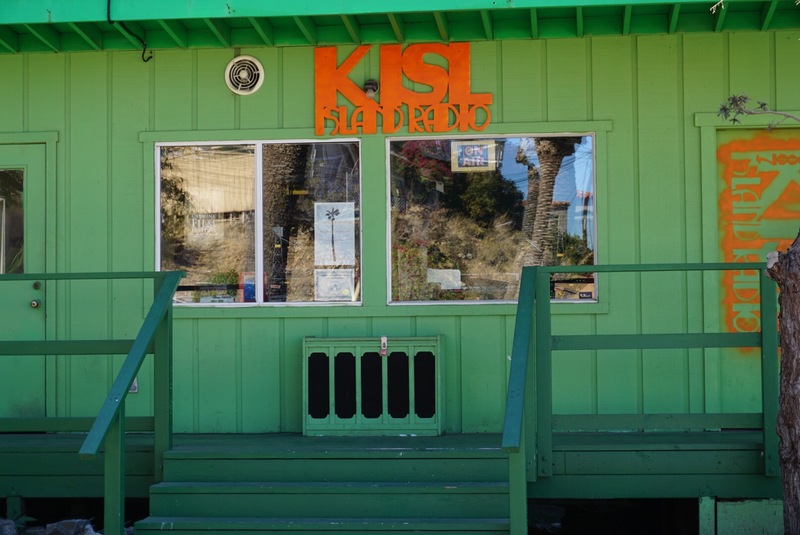 Further exploration led us to discover the local radio station, this small green building. We also talked to a woman who has resided on the island for 45 years and was eager to close her shop and accompany her grandchildren to the Halloween parade. 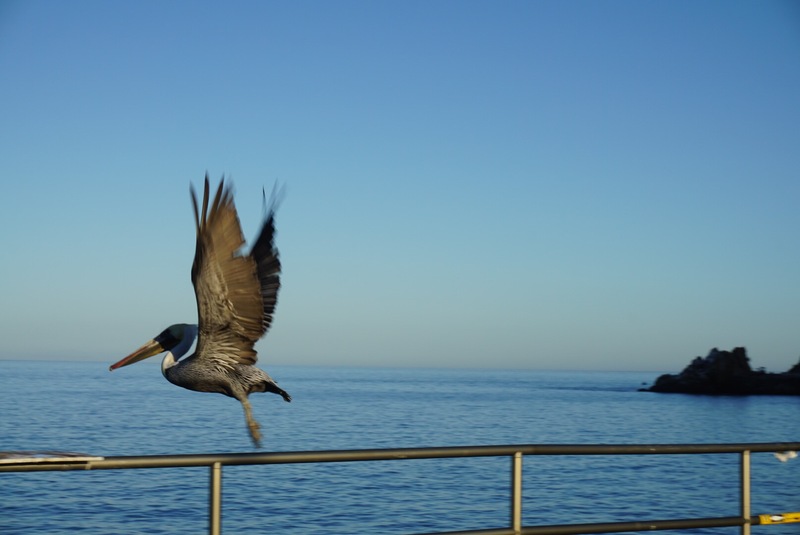 As we got ready to head back to Long Beach, we came across a friendly pelican who was more than willing to pose for photos. 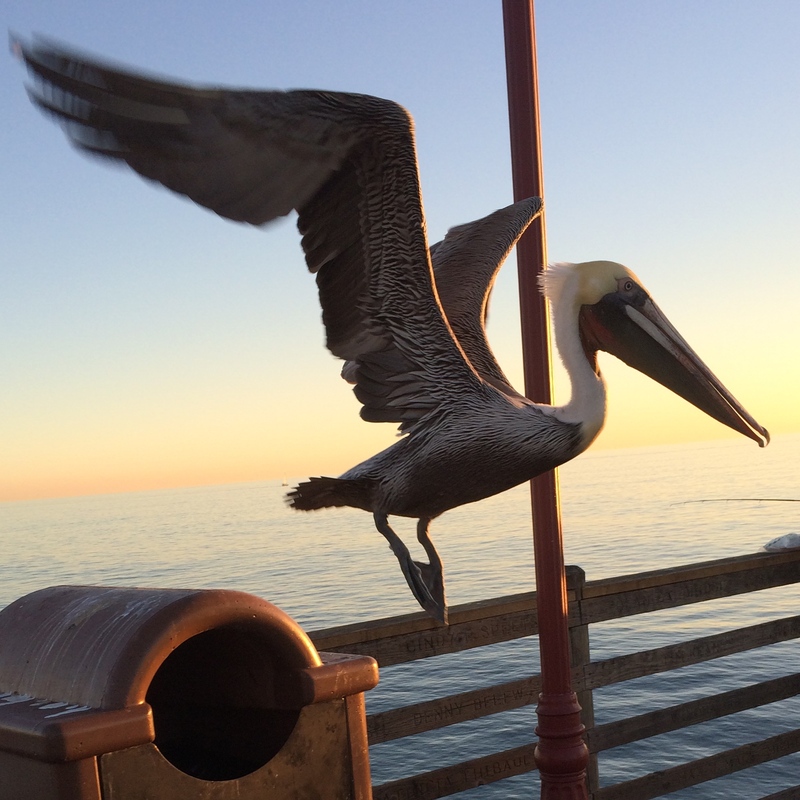 I took a number of shots and managed to snap this one as the pelican took flight. As the sun began to set, we said good bye to Avalon and headed back to the mainland. This adventure was quite a treat and a fun way to celebrate Geoff’s birthday. By the time we returned home, the trick-or-treaters were back home sorting their haul and we enjoyed a spectacular Halloween filled with wonder and play. Now the big question…how do we top this for next year? 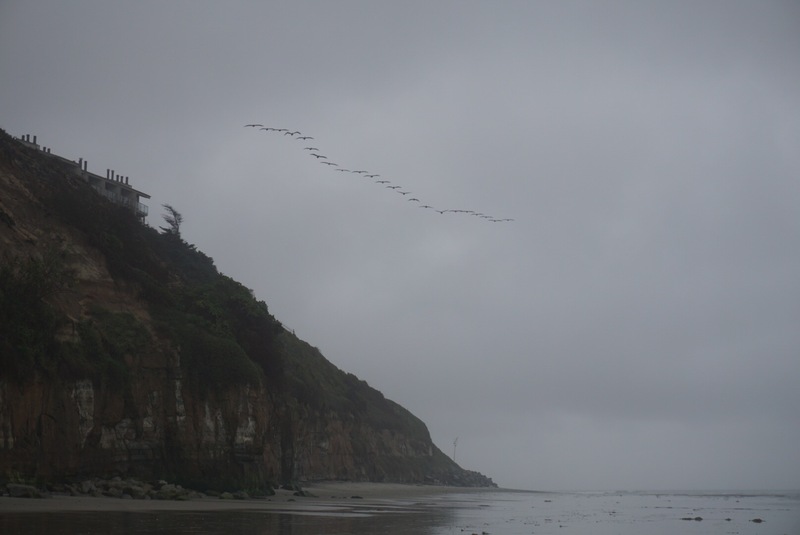 This entry was posted in clmooc, photography and tagged Catalina, Halloween, island, ocean, pelican, photo essay, postaday, treat, writing on November 2, 2015 by kd0602. Looking low formations also came into view. 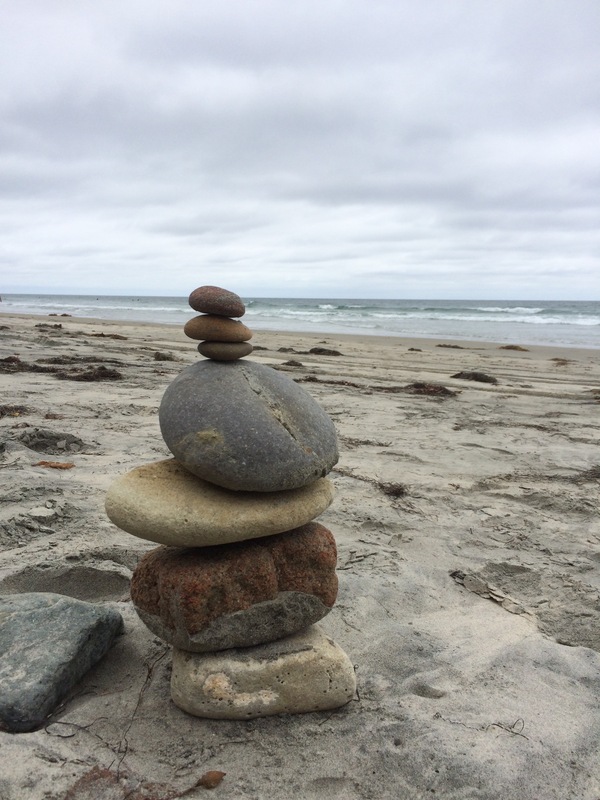 These rock sculpture formations crop up now and then on the beach…this one was standing all alone and caught my eye. A demonstration lesson by one of the SI participants had us exploring wind and air pressure through an experiment with a soap cap on a coke bottle. 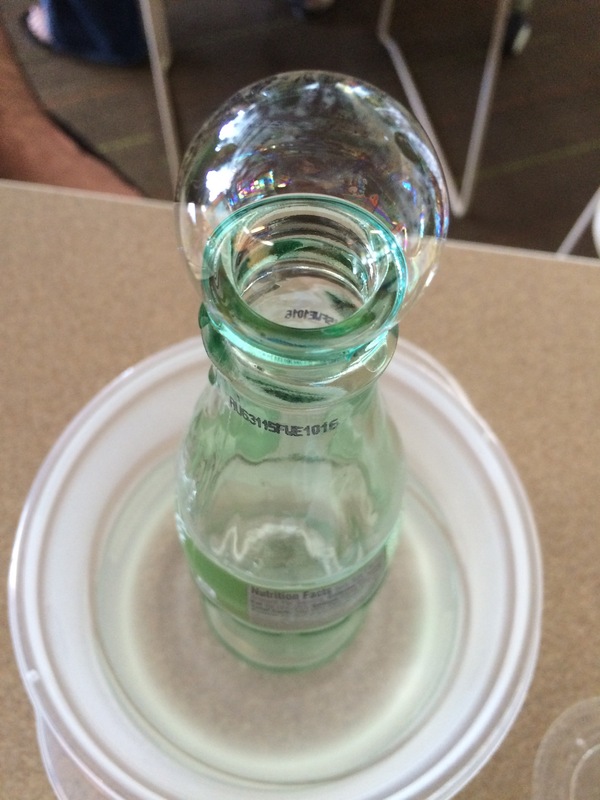 When we placed the bottle in warm water, a bubble formation appeared at the top! And today we engaged in an activity that requires the formation of thoughts and responses to some provocative quotes from readings we have done. 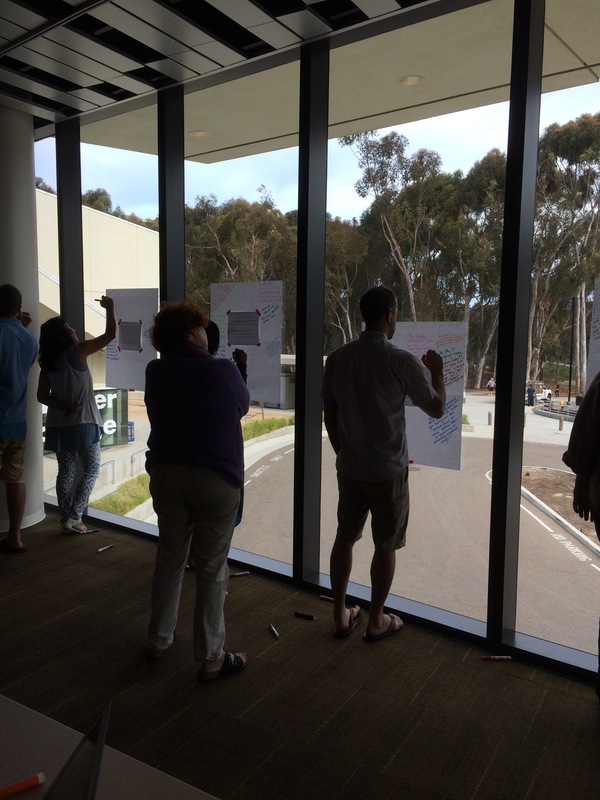 We still call it Chalk Talk even though we use markers on chart paper! So, go on a search for formation. You might spy some that form naturally or they might be manmade. Be on the lookout for esoteric formations too–you might find evidence of the formation of thought or action or change! I share my photography and writing on social media. You can find me on Instagram and Twitter using @kd0602. If you share your photos and writing on social media too, please let me know so I can follow and see what you are doing. 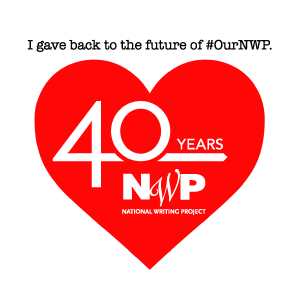 To help our Weekly Photo community find each other, use the hashtag #formation for this week and include @nwpianthology in your post. 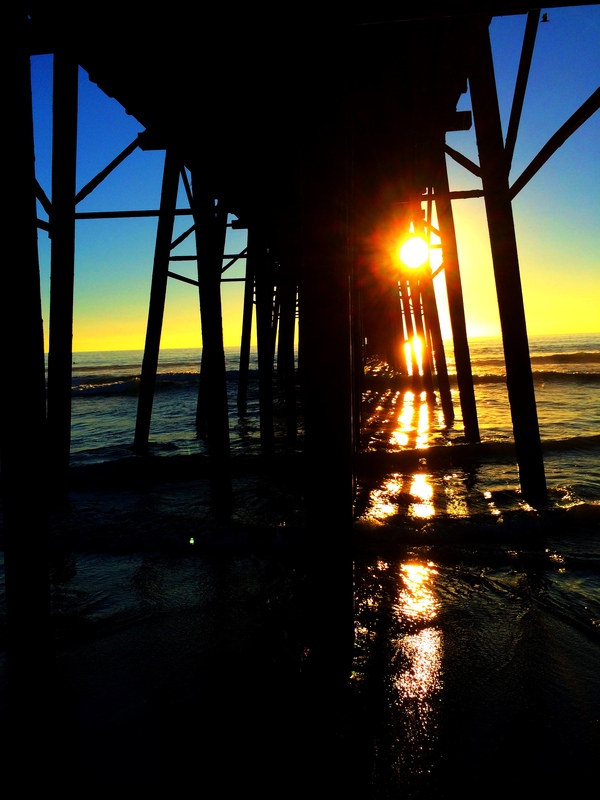 So grab your camera and find formation in your world this week. You can look indoors or out…or maybe combine with last week’s prompt of #makeart and create a formation of your own! 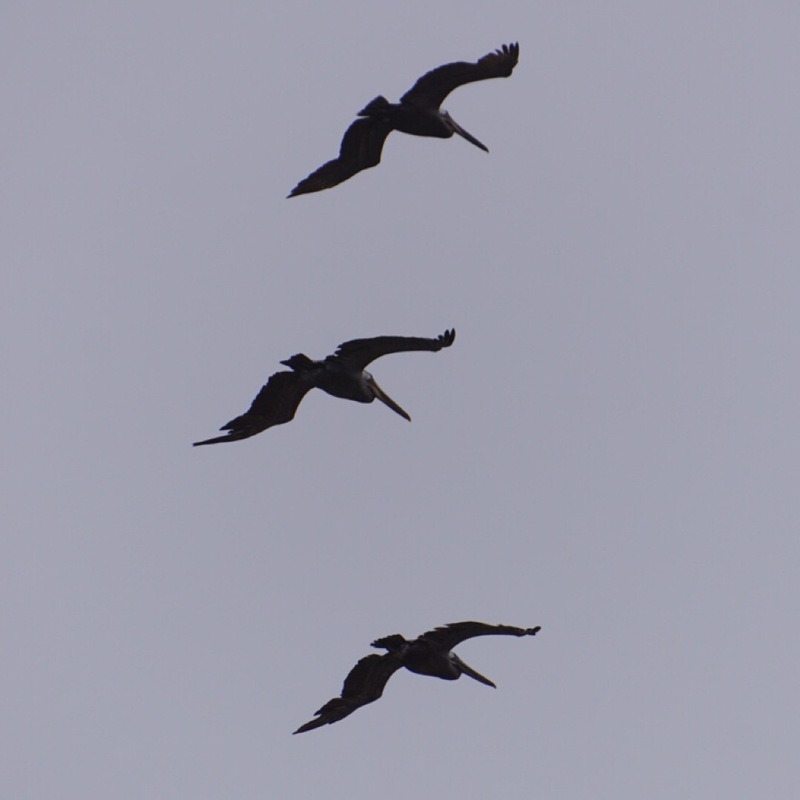 This entry was posted in clmooc, photography and tagged beach, formation, nwp ianthology, pelican, photo essay, writing on July 10, 2015 by kd0602. 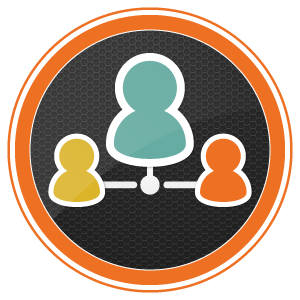 There are so many routines…and they help me get things done. They get me to work on time , allow me to accomplish the mundane and the inspirational work in my life, and remind me to make time for work and play, relaxation and exercise, books and art and more. But sometimes my routines get in my way. I almost let that happen today. I had a meeting at a school site near a picturesque part of our city. As I pulled up to park I thought about taking some time after the meeting to drive the couple of miles to the cove and see if there was anything to photograph. After my meeting I wanted to go home. I knew the traffic would be bad… and it gets dark so early these days…I had lots of excuses. 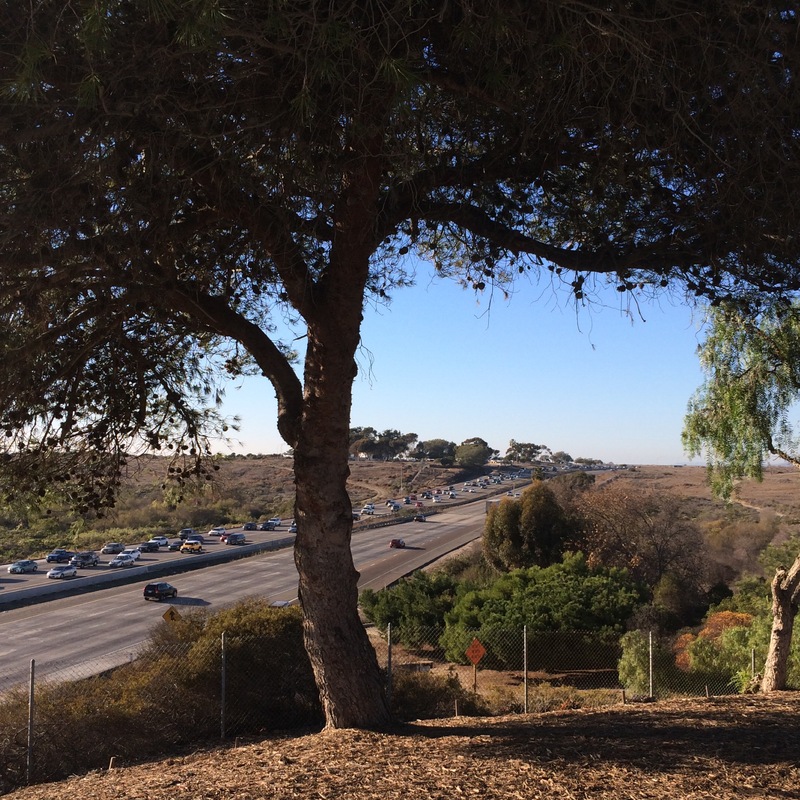 But then I decided to take that short drive anyway, even if it meant some miserable traffic on my way home. And I’m so glad I did! 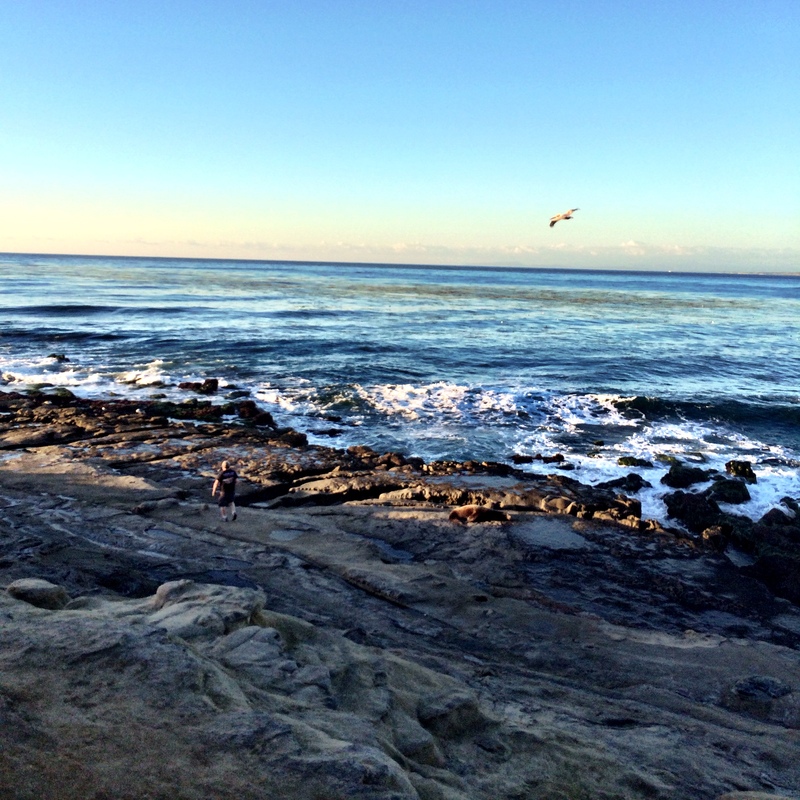 La Jolla Cove is truly a treasure. 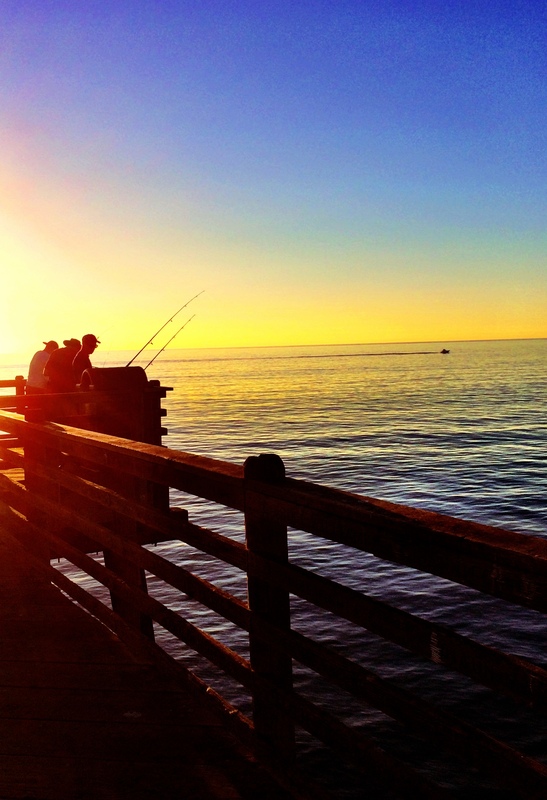 This little protected piece of ocean is a refuge for wildlife…and for people. When I pulled up and immediately found a parking place, I knew this would be worth the spontaneous decision. 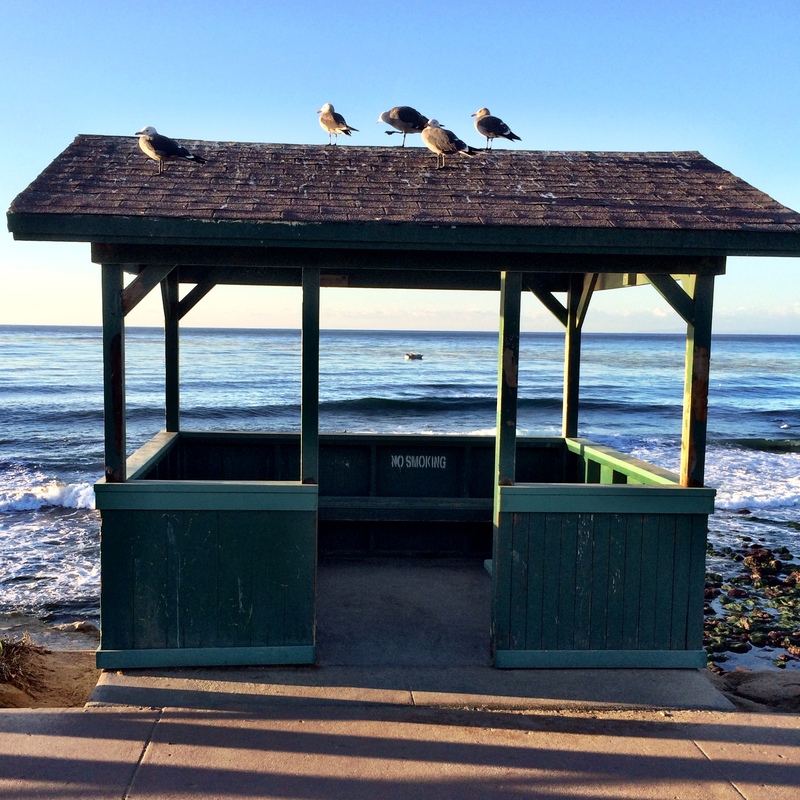 I first noticed this little structure with sea gulls roosting on top. Through it I could see a small fishing boat in the surf. As I continued up the walkway, I heard barking. 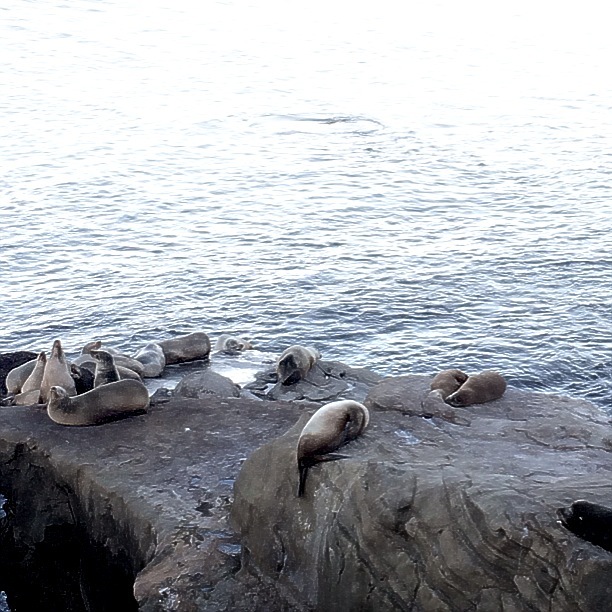 But it wasn’t dogs…it was sea lions! Some sunbathed in the cool December air while others seemed to play hide and seek in the waves. 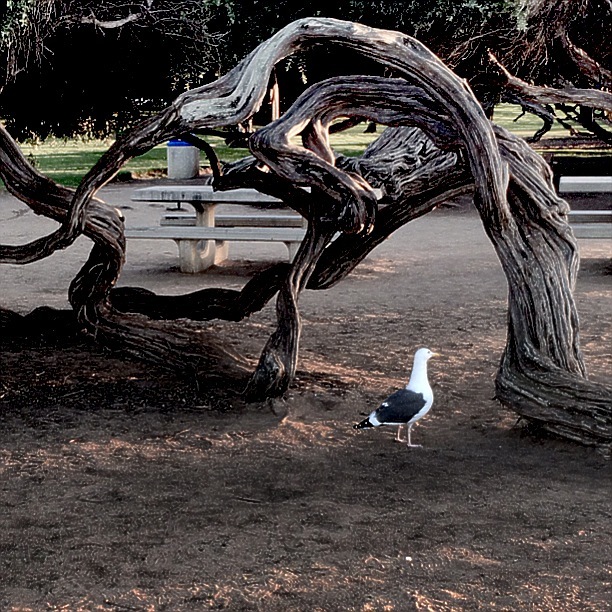 I noticed this big seagull cruising the park area. He had been perched up on the tree, but had moved on by the time I close enough to use my camera! I was right about the traffic, by the way. It took me more than an hour to get home after this excursion. But it was so worth it. My photos don’t begin to do justice to my experience. The sights and sounds and smells along with the crisp, cool air and low afternoon sun made for a perfect respite on a work day. 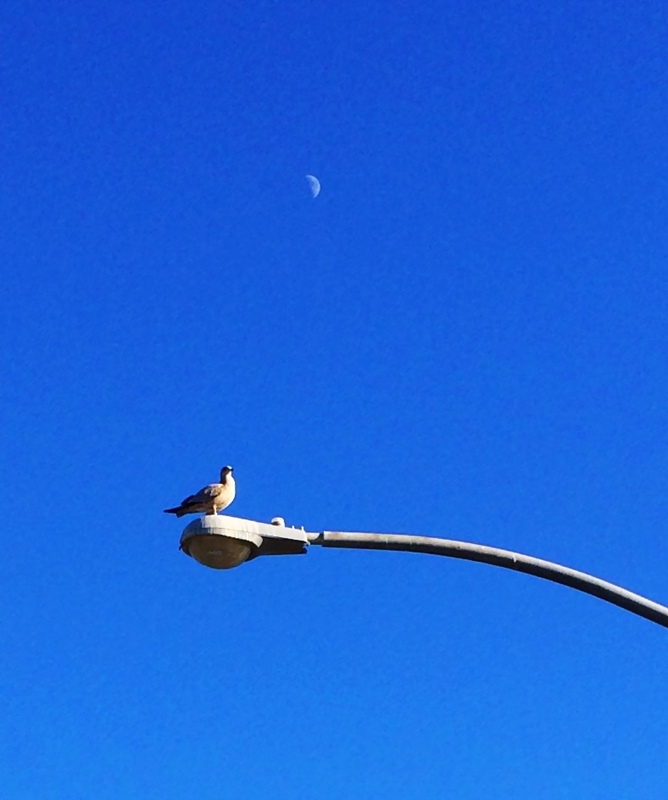 When I got home it was dark…and I noticed the sliver of moon rising. Geoff and I headed out after dinner to get gas for my car…and decided to stop by Starbucks for a cup of coffee. And spontaneously, as we turned the corner and spied the moon we headed off to the beach where we knew the view would be spectacular. And we weren’t disappointed. 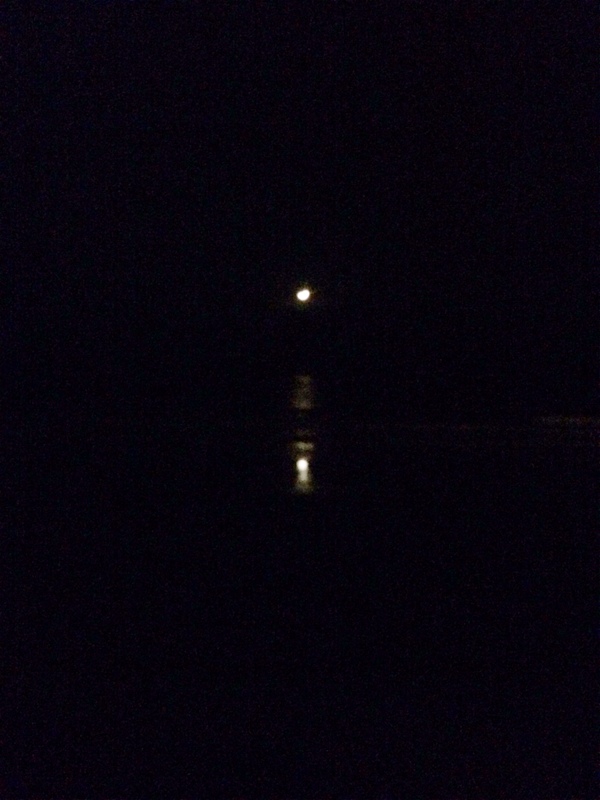 That shy smile of the moon reflected on the surf below. The colors were incredible…whites and golds. 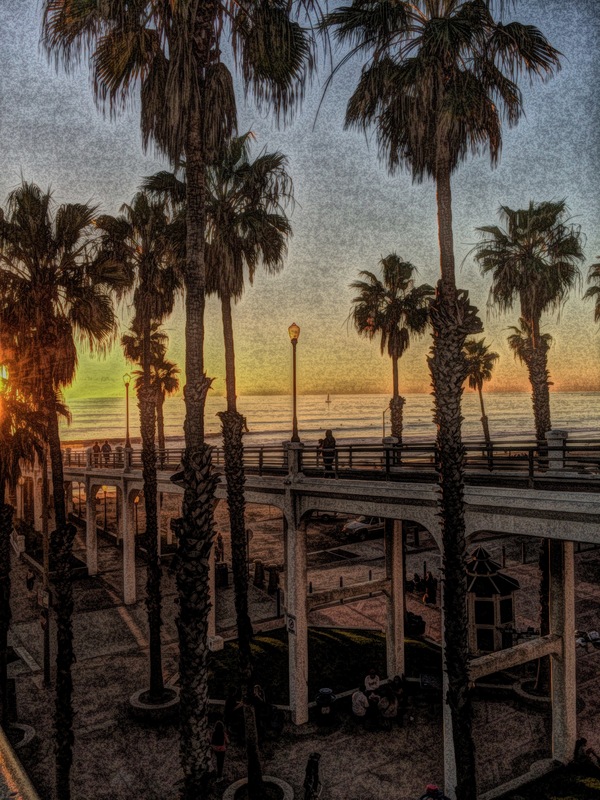 The moon made the water glow…and the froth of the surf curled in frosty waves. I tried my camera…with little success. But standing side by side in the dark appreciating the beauty of the moon and water in the cool of December with a hot coffee in our hands was priceless. A reminder to be spontaneous now and then. Routines can return tomorrow. 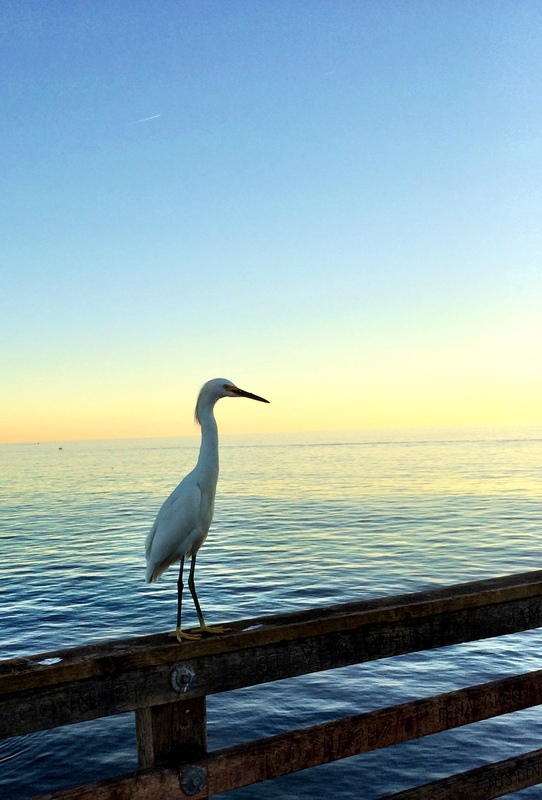 This entry was posted in photography and tagged gull, iphoneography, La Jolla Cove, moon, ocean, pelican, routine, sea lion, spontaneous on December 5, 2013 by kd0602.